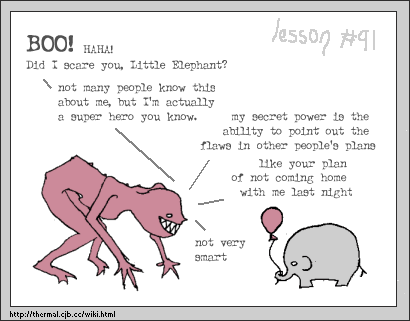 No one's ever asked what sort of traumatic incident occured in the little elephant's past to cause him to commit such horrible, violent acts. But maybe that's because no one reads the alt text. The truth is the little elephant left his hat in a library once and never saw it again. It was a very nice hat.